Empaths believe that their bodies should be used to heal those in need. They pay a great price for choosing this noble way, for they take the wounds of others onto their own bodies. The more serious the wounds they deal with, the greater the likelihood that the Empath suffers additional side effects from their healing. 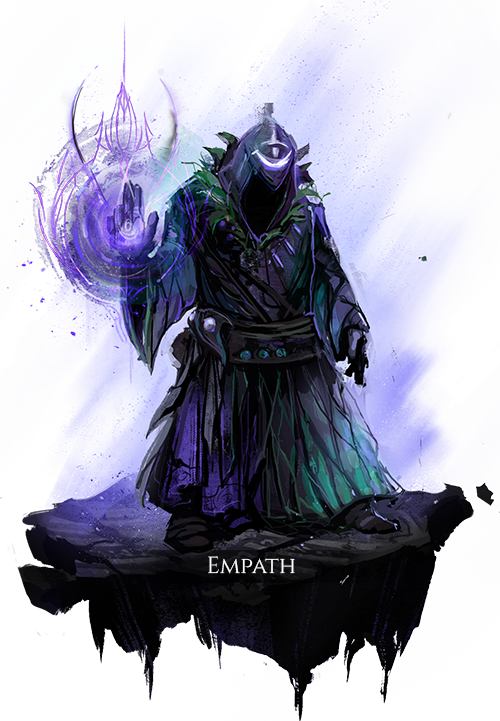 The reward for this sacrifice is equally impressive: Empaths have access to some of the most powerful heals of all the classes in all the Realms. To sacrifice oneself for others is the highest honor. Healing power is reduced based on missing health. Wounds suffered by the user which are not cured after a moderate duration begin dealing damage over time to the affected body part. Cures the target’s most severe wound and heals the affected body part for a small amount, while transferring a large amount of damage to the user, based on the power of the wound. Channel to slowly restore health to all body parts of the user, and cure any wounds when maximum health thresholds are reached. Creates a facsimile of the user of a type matching the effect of the primary component used. The Simulacrum provides the health and blood resources called for when the user and members of their group activate abilities that use the same effect type, while nearby. Only one Simulacrum of the user may be present at a time. Grants the user a life buff that greatly reduces health and blood loss from casting for a brief duration. Also applies a life debuff that greatly reduces health and blood restoration from all sources for a longer duration. Life energy emanates from the location of the user’s body and heals each of their nearby group members’ body parts by the amount of health lost to each of the user’s body parts over a moderate duration. This curse may be activated multiple times before death, increasing a multiplier of the duration and amount healed. When the user respawns they suffer reduced maximum health for a long duration based on the number of activations of Exploit Pain, as a part of their resurrection penalty.